Changing jobs to a different company, but pursuing the same line of work provides enough challenges as you transfer benefits, handle a possible move, and get used to new coworkers and office policies. However, if you want to change the job fields, you will be faced with a larger challenge. The job experience and training you currently have can help you, but you may need to do more to transition into a different career field. You need to have well-defined career goals to make the process easier. First, you should decide what career field you want to work in, instead of your current field. Some fields such as the medical profession, accounting or information technology may require specific technical training for you to complete the work. 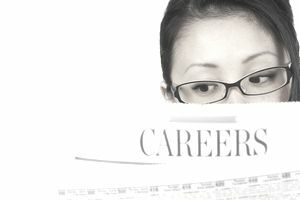 The career field you choose will determine how easy or difficult it is to transition into your new job. Before you make the commitment to transition, you should be sure that is something you really want to do. Talk to people who have been working in that field for several years. You should talk to people at several different companies, so you can get a broad view of what the industry is really like. Learn what additional training you will need to transition. Consider shadowing someone at the job for a day or two to see if it really is a good fit for you. Think about how the pay and time commitment for the new positions will affect your lifestyle. You may not be able to make a lateral move or a forward move with your new job. Some jobs may not pay as much, but you feel that you should transition to it, such as teaching. After you have decided on the field and researched it to make sure it is right for you, you need to begin acquiring the training necessary to make the switch. You may need to obtain another degree or additional certifications to qualify for the job. As you plan to make the transition, you should have a plan on you will pay for the training yourself. Your current job may be willing to pay for some of these if they are related to your current position in some way through. If you want to switch career fields, but you are willing to continue working at your current company this may be a great way to save on the cost of your tuition while you are in school. You can complete the additional training while you are in your current position. Once you have completed the training, you need to create a resume that will highlight the experience that you have and show how it will benefit your potential employers. Take time to look carefully at all of your previous responsibilities. Pick the ones that are related to your new job or that show your responsibility and reliability. Any experience you have should be beneficial in some way. It is important to study the type of resume that your new job is looking for. The requirements can change depending on the career field. This does not mean that your past experience will not help you with your new job. After you have highlighted the skills you have gained in other lines of work, you should begin utilizing your social network to look for a job. Getting the word out will help you find opportunities you may not know about. It also helps to have people already working with the company recommend you for the position. If you just finished a new degree to qualify for the job take advantage of the job search resources offered through your college. They can help you build your resume, practice interviewing and set you up with potential interviews at a job fair. It is important to widen your job search to give yourself more opportunities to land your dream job. As you transition over to your new job, you will switch your benefits. You will need to make sure that you continue to have health insurance. You may need to roll your 401(k) into an IRA or make the choice to leave it at your former company. Additionally, you may need to adjust to a different working environment. You may be working longer days with fewer shifts or you may find that you are required to be in touch with your company on a regular basis. These types of changes may happen any time you switch jobs, not just when you switch career fields. It is important that you do not burn any bridges when you leave your job. You may find that you do not like your new job, or you may need to go back to it after the career field changes. Additionally, the people you worked with can serve as references even if you are going into a different line of work. As you leave your current job, it is always nice to have another option available to you. If you can leave on a good note, it will widen your network when it is time to move on to a new job.